Why is chocolate milk a good post-exercise recovery drink? 20+ studies support the benefits of recovering with the high-quality protein and nutrients in lowfat chocolate milk. How you refuel after strenuous exercise can make a difference in how well you perform during your next workout – that’s why athletes grab chocolate milk for recovery. Read the science about lowfat chocolate milk for recovery here. What Are the Chocolate Milk Benefits After a Workout? Karfonta KE, Lunn WR, Colletto MR, Anderson JM, Rodriguez NR. Chocolate milk enhances glycogen replenishment after endurance exercise in moderately trained males. Medicine & Science in Sports & Exercise. 2010;42:S64. Gilson SF, et al. Effects of chocolate milk consumption on markers of muscle recovery during intensified soccer training. Medicine & Science in Sports & Exercise. 2009; 41:S577. Shirreffs SM, Watson P, Maughan RJ. Milk as an effective post-exercise rehydration drink. British Journal of Nutrition. 2007;98:173-180. Watson P, Love TD, Maughan RJ, Shirreffs SM. A comparison of the effects of milk and a carbohydrate electrolyte drink on the restoration of fluid balance and exercise capacity in a hot, humid environment. European Journal of Applied Physiology. 2008;104:633-642. Martin BR, Davis S, Campbell WW, Weaver CM. Exercise and calcium supplementation: effects on calcium homeostasis in sports women. Medicine & Science in Sports & Exercise. 2007; 39:1481-1486. Sawka MN, Montain SJ. Fluid and electrolyte supplementation for exercise heat stress. American Journal of Clinical Nutrition. 2000;72:564S-572S. Maughan RJ, Watson P, Cordery PA, Walsh NP, Oliver SJ, Dolci A, Rodriguez-Sanchez N, Stuart DR. A randomized trial to assess the potential of different beverages to affect hydration status: development of a beverage hydration index. American Journal of Clinical Nutrition. 2015;103:1-7. Seery S, Jakeman P. A metered intake of milk following exercise and thermal dehydration restores whole-body net fluid balance better than a carbohydrate–electrolyte solution or water in healthy young men. British Journal of Nutrition. 2016; 1-9. Hartman JW, Tang JE, Wilkinson SB, Tarnopolsky MA, Lawrence RL, Fullerton AV, Phillips SM. Consumption of fat free fluid milk following resistance exercise promotes greater lean mass accretion than soy or carbohydrate consumption in young novice male weightlifters. American Journal of Clinical Nutrition. 2007;86:373-381. Josse AR, Tang JE, Tarnopolsky MA, Phillips SM. Body composition and strength changes in women with milk and resistance exercise. Medicine & Science in Sports & Exercise. 2010;42:1122-1130. McCleave EL, Ferguson-Stegall L, Ding Z, Doerner PG, Liu Y, Kammer L, Wang B, Wang W, Hwang J, Ivy JL. Effects of aerobic training and nutritional supplementation on body composition, immune cells and inflammatory markers. Medicine & Science in Sports & Exercise. 2011; 23:442. Cockburn E, Hayes PR, French DN, Stevenson E, St Clair Gibson A. Acute milk-based protein-CHO supplementation attenuates exercise-induced muscle damage. Applied Physiology, Nutrition & Metabolism. 2008;33:775-783. Cockburn E, Stevenson E, Hayes PR, Robson-Ansley P, Howatson G, Effect of milk-based carbohydrate-protein supplement timing on the attenuation of exercise-induced muscular damage. Applied Physiology, Nutrition and Metabolism. 2010;35:270-277. Lunn WR, Colletto MR, Karfonta KE, Anderson JM, Pasiakos SM, Ferrando AA, Wolfe RR, Rodriguez NR. Chocolate milk consumption following endurance exercise affects skeletal muscle protein fractional synthetic rate and intracellular signaling. Medicine & Science in Sports & Exercise. 2010;42:S48. Lunn WR, Pasiakos SM, Colletto MR, Karfonta KE, Carbone JW, Anderson JM, Rodriguez NR. Chocolate milk & endurance exercise recovery: protein balance, glycogen and performance. Medicine & Science in Sports & Exercise. 2012;44:682-691. Karp JR, Johnston JD, Tecklenburg S, Mickleborough TD, Fly AD, Stager JM. Chocolate milk as a post-exercise recovery aid. International Journal of Sport Nutrition and Exercise Metabolism. 2006;16:78-91. 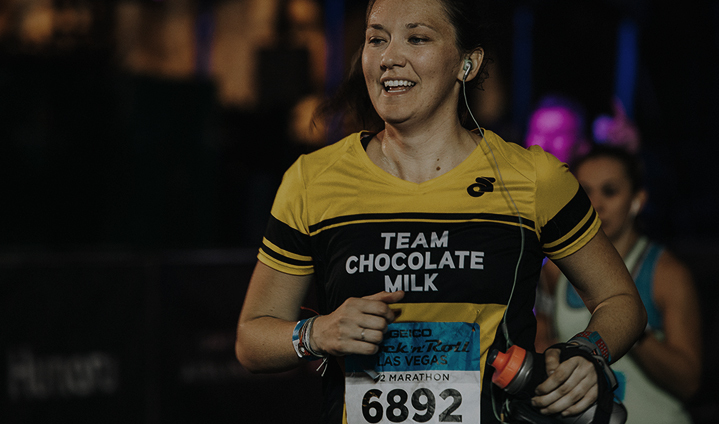 Thomas K, Morris P, Stevenson E. Improved endurance capacity following chocolate milk consumption compared with 2 commercially available sport drinks. Applied Physiology, Nutrition and Metabolism. 2009;34:78-82. Ferguson-Stegall L, McCleave EL, Ding Z, Doerner PG, Wang B, Liao YH, Kammer L, Liu Y, Hwang J, Dessard BM, Ivy JL. Postexercise carbohydrate-protein supplementation improves subsequent exercise performance and intracellular signaling for protein synthesis. Journal of Strength and Conditioning Research. 2011;25:1210-1224. Ferguson-Stegall L, McCleave E, Ding Z, Doerner Iii PG, Liu Y, Wang B, Healy M, Kleinert M, Dessard B, Lassiter DG, Kammer L, Ivy JL. Aerobic exercise training adaptations are increased by postexercise carbohydrate-protein supplementation. Journal of Nutrition and Metabolism. 2011. Epub. Stager JM, Brammer CL, Sossong T, Kojima K, Spanbaur D, Grand K, Wright BV. Supplemental recovery nutrition affects swim performance following glycogen depleting exercise. Presented at the American College of Sports Medicine, 2014. Potter J, Fuller B. The effectiveness of chocolate milk as a post-climbing recovery aid. Journal of Sports Medicine and Physical Fitness. 2015;55:1438-1444.